Many thanks to all participants, speakers and poster presenters for the great atmosphere during this fruitful, inspiring workshop! 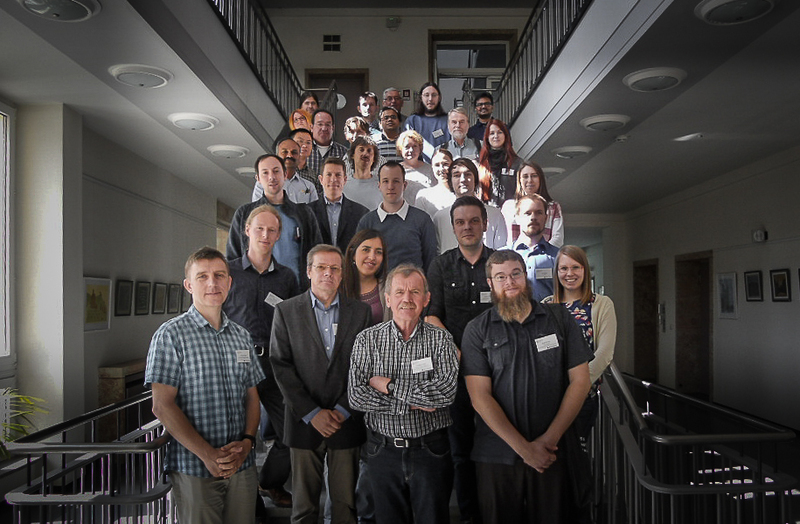 Workshop participants: Georg Benka, Christian Blum, Bernd Büchner, Gizem Aslan Cansever, Kazimierz Conder, Alma Dorantes, Andreas Erb, Diego G. Franco, Steffen Ganschow, Rongwei Hu, Anna Isaeva, Maik Jurischka, Seunghyun Khim, Pallavi Kushwaha, Frank Lichtenberg, Dirk Lindackers, Wolfgang Löser, Andrey Malyuk, John Mitchell, Ryan Morrow, Ahmad Omar, Ekaterina Pomjakushina, Dharmalingam Prabhakaran, Andrey Prokovief, Aswartham Saicharan, Paul Saß, Robert Schöndube, Michael Schulze, Franziska Seifert, Dietmar Siche, Dmitry Souptel, Hannes Stummer, Mihai Sturza, Christian Suttner, Michael Vogl, Katharina Weber, Stephen Wilson, Sebastian Witt, Nora Wolff, Sabine Wurmehl, Binghai Yan. 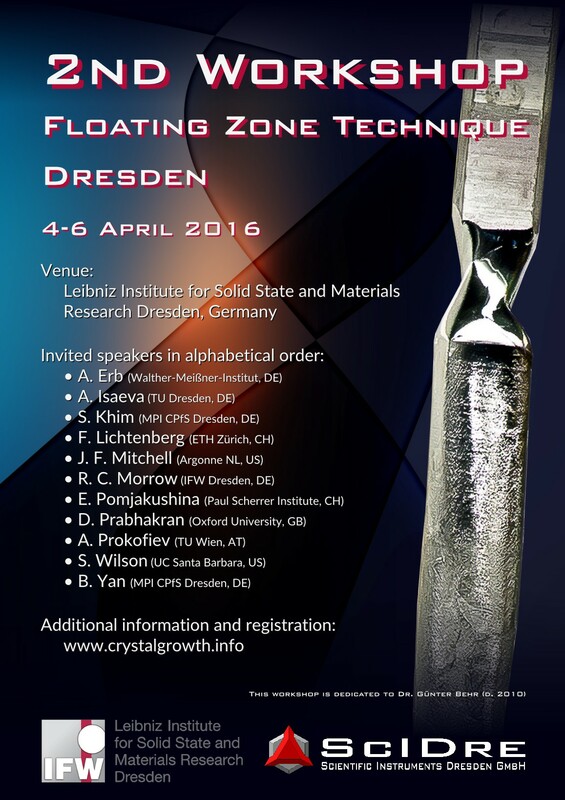 The 2nd workshop „Floating Zone Technique“ crystal growth took place in Dresden, Germany, on April 4-6 2016, at the Leibniz Institute for Solid State and Materials Research Dresden (IFW Dresden). 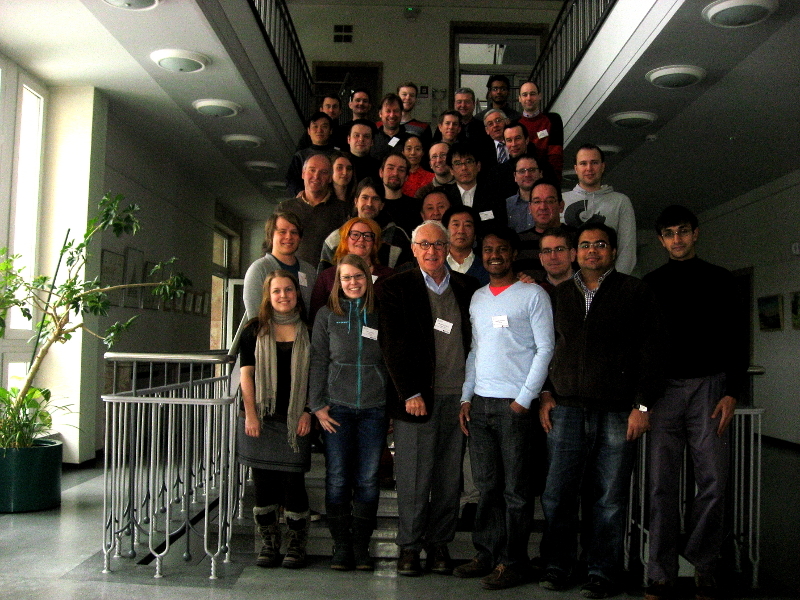 The meeting was organized by the crystal growth group of the IFW and the Scientific Instruments Dresden GmbH. 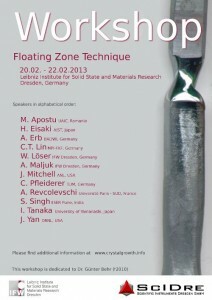 This workshop provided a unique platform for the presentation and discussion of recent research and development activities in all aspects of the floating zone crystal growth. 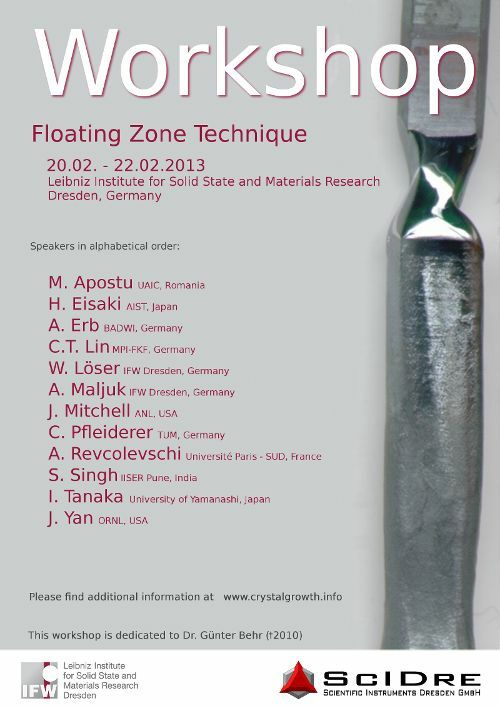 The programme included invited and contributing talks and posters providing a picture of the latest developments in the field of floating zone crystal growth and beyond, and plenty of possibilities for individual conversations. The workshop program is available for download.